The final schedule for the Nationals competition on 2nd/3rd May and event details involving CoPA swimmers can be found below. There will be additional team training on Sunday 29th March for those team members taking part in the forthcoming Nationals competition. Shannon successfully renewed her skill level 5. Synchronised Swimming – What Happens Underwater! 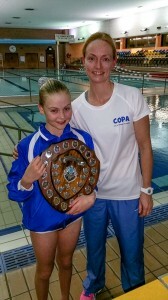 Big congratulations to Daisy on being awarded CoPA “Swimmer of the Year” 2014! Daisy, pictured here with coach Fiona was presented with her trophy at the annual CoPA Christmas Display last night and has her name added to the long line of swimmers to have received this award in past years. Well done Daisy! CoPA Dominate at the ASA Masters! Huge congratulations to the following for their achievements which collectively and individually made for a very impressive showing at the ASA Masters in Telford. Beth won a silver medal in the 20-29 age group technical solo event, with Shannon gaining bronze in the same category. Fiona won a gold medal in the age 40-49 technical solo category. In the technical duets, Shannon and Beth took silver in the 20 – 29 age group, whilst Fiona and Megan were awarded gold in the 30-39 age group. Beth gained a silver medal in the 20-29 age category for her free solo routine, with Shannon taking bronze. Meanwhile Fiona was busy garnering another gold medal in the 40-49 age category. Beth and Shannon were awarded another silver medal in the 20-29 age group free duets, with Fiona and Megan grabbing another gold for their routine in the 30-39 age category. Finally, the CoPA team took bronze in the combination team event. A full report on the competition can be found on the ASA web site. A fantastic effort by all the CoPA girls who took part, well done! Congratulations to Lydia who achieved Skill Level 5, Sheena who achieved Skill Level 4, Tilly and Sophie who passed Skill Level 3, and Leah who gained Skill Level 2.